A classic outdoor fleece vest that’s perfect for quick hikes, cool walks to campus or work, and cold-weather travels, the Men’s Mt. Elliot Vest offers essential core warmth any day there’s a chill in the air. Designed with stretchy 200gm merino wool terry RealFLEECE® fabric, the Mt. Elliott has a brushed back that provides ample warmth while remaining lightweight and highly packable. Zippered hand and chest pocket keep your small items secure, and Icebreaker's Oasis fabric lines the pockets and collar for a soft touch. Mt Elliot Vest - Mens is rated 4.4 out of 5 by 14. Rated 5 out of 5 by Foxbat from Keeps me warm Excellent fit. I have to wear short sleeves at work and this is the perfect fashionable solution to keep me warm. Rated 5 out of 5 by Scap from Daily wear Vest I was looking for a vest to keep core warmth during West Coast hikes and outdoor activities. After trying the Mt Elliot vest, it quickly became a daily wear item. A fantastic addition to my other Icebreaker items. Rated 5 out of 5 by dave29 from great vest I love this vest so much that I just bought a third one in a year or so : it's thinner but warmer than the fleece ones I was using, and fits wonderfully under a suit, while still looking good. I'm 5'10" 150 lbs, but a small is still a bit big, though. Rated 1 out of 5 by Rocdoc from poor styling I found the overall look and feel of this vest to be poor - the style and cut just didn't work. Too bad - I love Icebreaker stuff in general. Rated 3 out of 5 by RJ57 from Not the fit I expected! 6' and 200 pounds. Bought extra large. Chest fits well but do not like the way the waste fits or hangs. Bought it on sale or I would have returned it. That said, I do like its warmth and it will do well for cooler days when I don't want sleeves of as a mid-layer. Rated 5 out of 5 by whistler1 from Better than the rest. Bought this for my son. He's 6ft tall and medium fits perfectly. It's an ideal everyday vest that works great with either a t-shirt or buttoned shirt underneath. The merino wool is comfortably soft and feels very durable as well. You won't be disappointed. Rated 5 out of 5 by Annie from Can Icebreaker get any better? 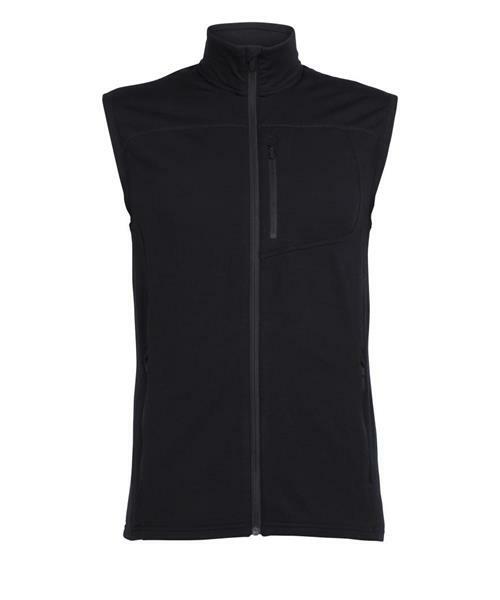 I have owned many merino wool items over the years including Icebreaker and this vest is even better! The light fleece lining adds that little bit of extra warmth/comfort that is unbeatable. If your looking for a light vest to wear look no further!